The Genealogical World of Phylogenetic Networks: Phylogenetics of computer viruses? There is a difference between phylogenetics and clustering or classification. The latter processes put objects into groups based on some intrinsic features, but the former uses their intrinsic features to expresses their evolutionary history. Not all objects have an evolutionary history, even though they can all be put into groups. Furthermore, even objects that do have a history do not necessarily have an evolutionary history. Evolution involves ancestor-descendant relationships (as well as sister-group relationships), and not all of history involves ancestors and descendants. This distinction is important for the use of phylogenetics as a metaphor for the history of non-biological objects. Outside of biology, many things are claimed to have a "phylogenetic history", including languages and most human artifacts. As I have noted before, one has to be careful when applying this metaphor (see False analogies between anthropology and biology). One particular example that I have encountered involves the development of computer viruses and other malware (Iliopoulos et al. 2008). Metaphorically, such viruses can be seen to be phylogenetically related, because new viruses are often based on previous ones — that is, one virus "begets" another virus due to changes in its intrinsic attributes. In this sense the metaphor is helpful, although there is no actual copying of anything resembling a genome — this is phenotype evolution not genotype evolution. 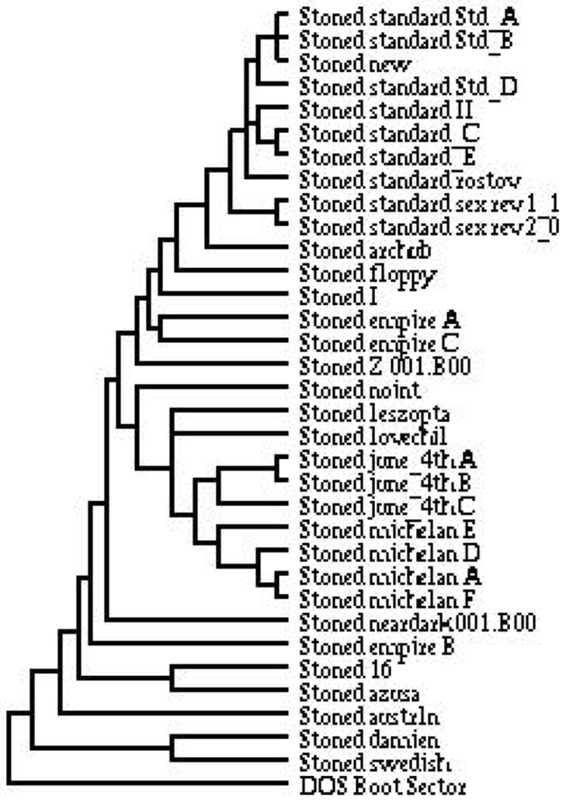 Sorkin (1994) seems to have been the first to discuss the possibility of computer virus evolution, but the first empirical attempt to reconstruct a digital phylogeny appears to have been by Hull (1995b), who studied the Stoned computer virus (a virus that infected the boot sector of PCs between 1990 and 1995), as shown below. In all cases the phylogeny was produced using a distance-based clustering algorithm (ie. the tree is a phenetic one). Some of the distances are well motivated in terms of historical changes in the intrinsic attributes of the malware, but that does not necessarily make the resulting phenogram a phylogeny. So, the methods use basic clustering techniques to produce a tree, thus treating classification as phylogenetics (or phenetics as phylogenetics). This certainly clusters the objects, but there is no necessary reason for the clustering to reflect phylogeny. Thus, a simple concept of clustering is inadequate, even though it can be used to construct a tree. A phylogenetic tree expresses the nested hierarchy formed by the shared derived character states, but not by anything else. A tree expresses nested clusters, but it is a form of "special nesting" that expresses a phylogeny. Only one form of tree is relevant to phylogenetics, and trees formed in other ways are likely to be suitable only under the simplest circumstances. Computer viruses evolve in complex ways not usually encountered in nature. The transplantation of large segments of computer code from one virus to another need not represent evolutionary relationship, for example. A newer virus may just represent a debugged or patched earlier version. The virus author may have deliberately incorporated parts of other viruses as a short cut, or because the plagiarized code is useful. If the virus incorporates code generating 'engines', similar code may appear in viruses with no other similarities. Structural similarities deriving from functional similarities likewise derive from several sources. As we now know, these sorts of evolutionary events are usually found in nature, but they create reticulate histories, involving horizontal as well as vertical evolution. That is, computer virus phylogenetics involves reticulation — new computer code takes bits and pieces from various previous viruses. In particular, there is also what is called "oblique" evolution, in which there is horizontal evolution between generations. This is a characteristic of many histories involving human artifacts (see Time inconsistency in evolutionary networks), and it allows information to "time travel", so that the information available for horizontal transmission can come from the distant past as well as from the present. So, malware evolution is not tree-like. Only two of the papers cited above seem to acknowledge this fact. Khoo & Lió (2011) were quite conventional in using splits graphs rather than unrooted trees to display their data, although they do not specify the algorithm for producing the networks. They do, however, claim that "networks were more useful for visualising short nop-equivalent code metamorphism than trees". Goldberg et al. (1996) were more innovative, and analyzed their data using what they called a "phyloDAG", which is a directed network that can have multiple roots (it appears to be a type of minimum-spanning network). Interestingly, they note that "Beyond the computer virus realm for which it was conceived, the phyloDAG is also a plausible model for evolution of bacterial populations." Indeed, the possibility of multiple roots has been explicitly suggested for prokaryote phylogenetics (see Can networks have multiple roots?). I wouldn't doubt that it is also feasible for language history. Carrera E, Erdélyi G (2004) Digital genome mapping – advanced binary malware analysis. Virus Bulletin Conference 2004. Guan Q, Tang Y, Liu X (2012) A malware homologous analysis method based on sequence of system function. Advanced Science and Technology Letters, ASTL 15: Advanced Computer Science and Technology. Science and Engineering Research Support Society, Sandy Bay, Tasmania, Australia. Hayes M, Walenstein A, Lakhotia A (2009) Evaluation of malware phylogeny modelling systems using automated variant generation. Journal in Computer Virology 5: 335-343. Hull DB (1995a) Computer viruses: naming and classification. Virus Bulletin Sept: 15-17. Hull DB (1995b) Computer viruses: naming and classification, part II. Virus Bulletin Oct: 16-17. Iliopoulos D, Adami C, Ször P (2008) Darwin inside the machines: malware evolution and the consequences for computer security. Virus Bulletin Conference 2008. Ji J-H, Park S-H, Woo G, Cho H-G (2008) Generating pylogenetic tree of homogeneous source code in a plagiarism detection system. International Journal of Control, Automation, and Systems 6: 809-817. Karim ME, Walenstein A, Lakhotia A (2005a) Malware phylogeny using maximal pi-patterns. Proceedings of the EICAR 2005 Conference, pp 156-174. Karim ME, Walenstein A, Lakhotia A, Parida L (2005b) Malware phylogeny generation using permutations of code. Journal in Computer Virology 1: 13-23. Khoo WM, Lió P (2011) Unity in diversity: phylogenetic-inspired techniques for reverse engineering and detection of malware families. Proceedings of the 2011 First Systems Security Workshop (SysSec'11), pp 3-10. IEEE Computer Society Washington, DC. Ma J, Dunagan J, Wang HJ, Savage S, Voelker GM (2006) Finding diversity in remote code injection exploits. Proceedings of the 6th ACM SIGCOMM Conference on Internet Measurement, pp 53-64. ACM, New York. Sorkin GB (1994) Grouping related computer viruses into families. Proceedings of the IBM Security ITS 1994. Wagener G, State R, Dulaunoy A (2008) Malware behaviour analysis. Journal in Computer Virology 4: 279–287. Walenstein A, Hayes M, Lakhotia A (2007) Phylogenetic comparisons of malware. Virus Bulletin Conference 2007. Webster M, Malcolm G (2007) Classification of computer viruses using the theory of affordances. Second International Workshop on the Theory of Computer Viruses.